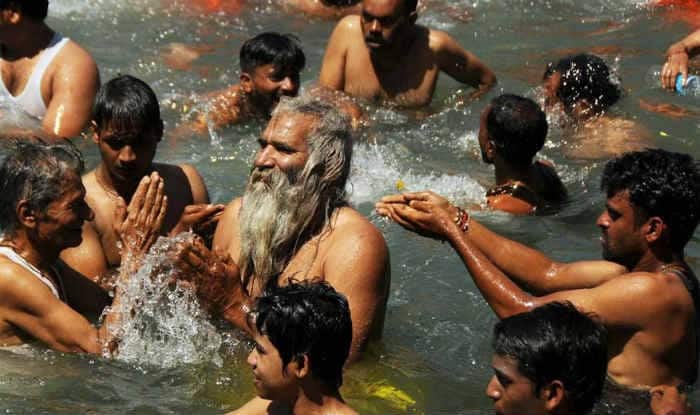 Thousands of pilgrims took a holy dip at the Sangam (the confluence of the Ganga, Yamuna and mythical Saraswati rivers) in Uttar Pradesh on Monday, January 21 on the occasion of ‘Paush Poornima’ at the Kumbh Mela. After the Makar Sankranti, this is the second holy bathing (Shahi Snan) for the devotees. Thousands of devotees, including women and children, walked several kilometres of the kumbhnagar to make their way to the river. Tight security has been arranged for the smooth passage and rituals to take place. The main rituals and bathing kicked off on Monday morning. The ‘Kalp Vaas’ where devotees give up their pleasures and connections to live the life of hermits for a brief period also began this morning. During this period, devotees will be separated from their families and engage themselves in singing bhajans, chanting hymns and perform other rituals. As per the ancient legends, Lord Vishnu was travelling across the country with his Kumbh and during his journey, four drops of amrit fell on the earth. Today, those four places – Allahabad, Varanasi, Haridwar and Ujjain host the Kumbh Mela. The mela will extend up to 48 days, drawing millions of pilgrims from across the world, who take the holy dip at the sacred confluence of the Ganga, Yamuna and Sarasvati rivers. The usual Kumbha Mela is held after every three years, whereas the Ardha Kumbha Mela is held after every six years in Prayag and Haridwar. However, Purna Kumbha Mela takes place after every 12 years in one of those four places, based on planetary movements.